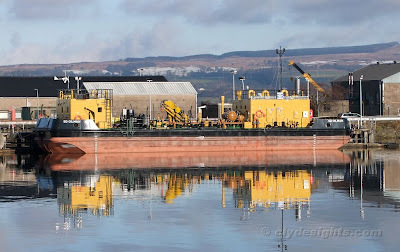 One of the other Serco vessels about to be replaced is SD OILPRESS, the small motor barge that takes fuel out to naval ships in need of bunkers. Her successor is the dumb barge SD OILMAN, built in Poland and completed by Damen in the Netherlands. She arrived at Greenock in mid-December, towed by the Polish-owned tug SERVAL. SD OILMAN is a Damen DBa 3009 lighter, with a length of 30.42 metres and a beam of 8.50 metres. A sloightly smaller water barge is due to be delivered later this year - she will be named SD WATERPRESS. The names of these two barges reflect those of the two ships being replaced, SD OILPRESS and SD WATERMAN.